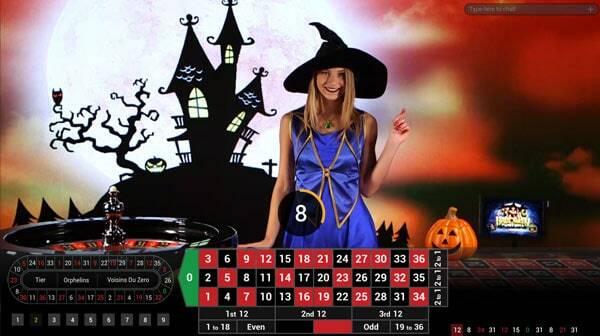 Playtech has released Halloween Fortune Live Roulette in the run up to Halloween. It’s available at all Playtech Live Casinos with a special Opt-In promotion offering free spins on the Halloween Fortune Slot. The table is a Playtech One Product, which is Playtech’s way of bringing together common themed products to offer players a total playing experience. We’ve see a similar setup with the Age of the Gods table recently. In this case, as it’s coming up to Halloween, the premise of the Halloween Slot has been taken one step further with a fully branded live Halloween Fortune Roulette table. There is no doubt this is a flagship product for Playtech. The effort they have put into this for a relatively short period of time is quite impressive. The big video wall is being used to set the Halloween mood and the dealers, who have been specially chosen to host the table are dressed in ghoulish outfits.